We’d love your help. 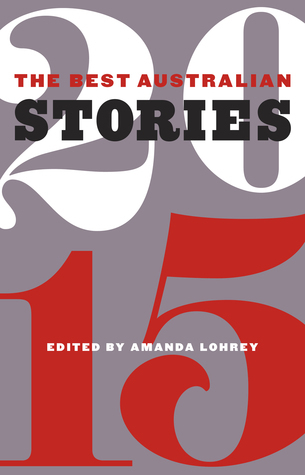 Let us know what’s wrong with this preview of The Best Australian Stories 2015 by Amanda Lohrey. In The Best Australian Stories 2015, Amanda Lohrey, winner of the Patrick White Award and author of the acclaimed novel A Short History of Richard Kline, curates twenty pieces of exceptional short fiction. Published November 2015 by Black Inc.
To ask other readers questions about The Best Australian Stories 2015, please sign up. Leggendolo mi sono reso conto che da questa raccolta mi aspettavo un'Australia turistica, quando invece l'Australia non è l'ambientazione obbligatoria (il primo racconto è in Italia, ma abbiamo anche Africa, Giappone, Malesia e Indonesia). Spesso era in qualche dettaglio buttato lì, nomi e atteggiamenti che due anni fa non avrei notato. L'altra sorpresa è stata ricordarmi che un'antologia senza un tema, senza neanche la nazionalità australiana come requisito, scritta da autori diversi e spesso es Leggendolo mi sono reso conto che da questa raccolta mi aspettavo un'Australia turistica, quando invece l'Australia non è l'ambientazione obbligatoria (il primo racconto è in Italia, ma abbiamo anche Africa, Giappone, Malesia e Indonesia). Spesso era in qualche dettaglio buttato lì, nomi e atteggiamenti che due anni fa non avrei notato. L'altra sorpresa è stata ricordarmi che un'antologia senza un tema, senza neanche la nazionalità australiana come requisito, scritta da autori diversi e spesso esordienti, non può fare a meno di avere un pregio: ogni racconto è da considerarsi a sé stante, se ce n'è uno che ti ha fatto impazzire il prossimo può anche farti schifo, e viceversa. I love the short form. The investment needed is far less than that needed for a novel, but the pay-off is just as satisfying, if not more so. This collection does not disappoint. In the introduction to this collection, Amanda Lohrey explains what she looks for in a short story - she wants to be told something new, to be surprised by the writing and most of all she looks for what she calls a "hit" - something that leaves her stirred in the same way you feel when you see an astonishing athletic achievement. In the main, this collection delivers on that criteria, although there were some that fell below the radar for me. Those that stirred me the most were John A. Scott's " In the introduction to this collection, Amanda Lohrey explains what she looks for in a short story - she wants to be told something new, to be surprised by the writing and most of all she looks for what she calls a "hit" - something that leaves her stirred in the same way you feel when you see an astonishing athletic achievement. In the main, this collection delivers on that criteria, although there were some that fell below the radar for me. Those that stirred me the most were John A. Scott's "Picasso: A Shorter Life", Melissa Beit's "The Three Treasures", Gay Lynch's "The Abduction of Ganymede"and Julie Koh's "The Level Playing Field." I didn't end up reading all of the stories as this collection just did absolutely nothing for me. Nothing actually happens in a lot of these stories. They may be well written, but being well written means nothing if they're boring. A great selection of Australian shorts. A varied & entertaining selection. Amanda Lohrey is a novelist and essayist. She was educated at the University of Tasmania and Cambridge. She lectured in Writing and Textual Studies at the Sydney University of Technology (1988-1994), and since 2002 at the School of English, Media Studies and Art History at the University of Queensland in Brisbane.